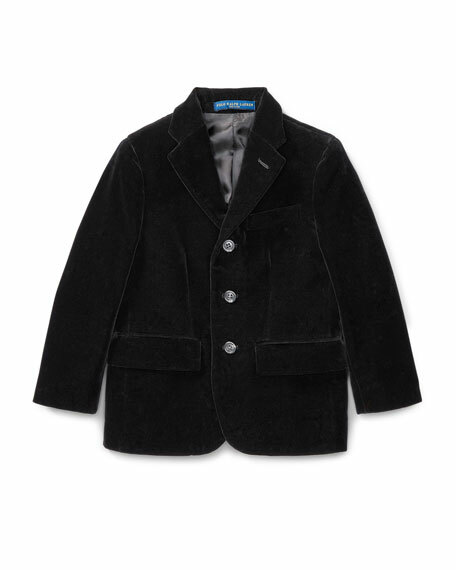 Ralph Lauren Childrenswear "Polo II" velvet blazer. Andy & Evan boys' suit in pinstripes. Notched collar blazer featuring check detail welt pocket. Long sleeves; three-button cuffs. Two-button front; cutaway hem. Flap pockets at waist. Straight leg, flat-front trousers. Polyester/rayon/spandex. Imported. Appaman sport coat in woven jacquard. Contrast satin shawl collar; two-button front. Long sleeves; three-button cuffs. Welt pocket at chest; front flap pockets. 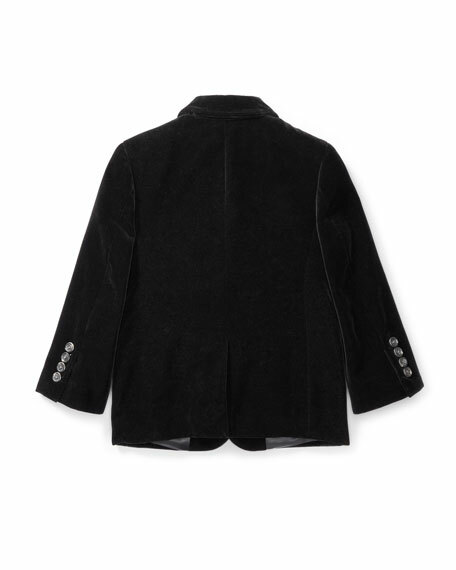 Tailored seaming; vented hem. Body: polyester/rayon. Logo lining: polyester. Dry clean. Imported. Appaman mod two-piece suit set with logo-print lining. Narrow notch lapel; two-button front. Three-button detail at cuffs. Chest welt pocket. Appaman mod two-piece suit set with logo-print lining. Narrow notch lapel; two-button front. Three-button detail at cuffs. Chest welt pocket. Waist flap pockets. Center vent. Straight leg, flat-front trousers. Polyester/rayon; polyester lining. Imported. Berluti blazer in herringbone. Notched lapels; two-button front. Flap pockets; chest welt pocket. Double-vented back. Wool/spandex. Made in Italy. Model's measurements: Height, 6'2"/188cm, Suit 38R, Shirt 15.5x34, Waist 32"/81cm, Inseam 32"/81cm.